She is a tiny pocket rocket with as much fizz and buzz as a bottle of champagne popping open. He is lean and lanky — more an austere whisky with a surprise twist that brings a smile to the face and a twinkle to the eye. Together, they call themselves The Magpies. They’re catchphrase is “singing for fun”. But the truth is they’re not just singing for fun, they’re living for fun. This adventurous couple grab life with both hands and squeeze every inch of possibility and joy out of it, flinging as much of it around to others as they can. They’ve been together for a decade and it’s been quite a ride. 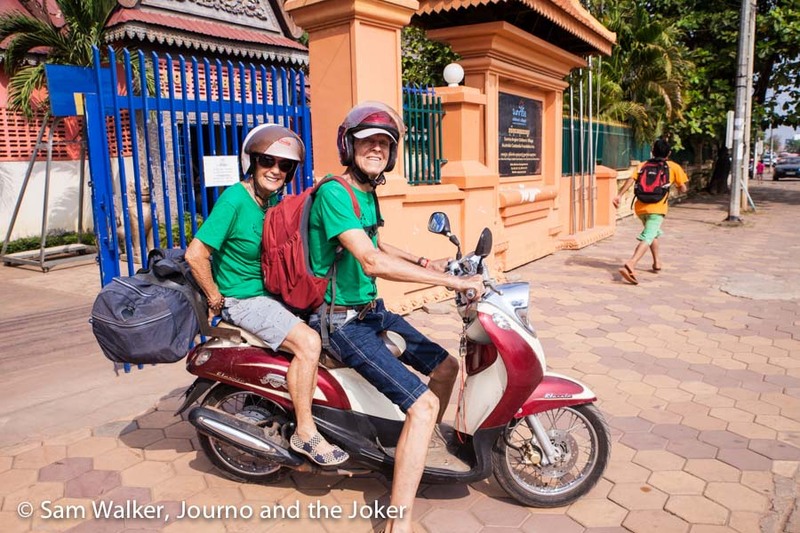 Months after hooking up in their late 60s they moved to Vietnam to live and to teach English. Nothing like the challenges of a developing country to put a relationship to the test but the experience made them closer than ever and they’ve been sharing adventures ever since. Because for this pair, life really is an adventure. And 2015 was no exception. 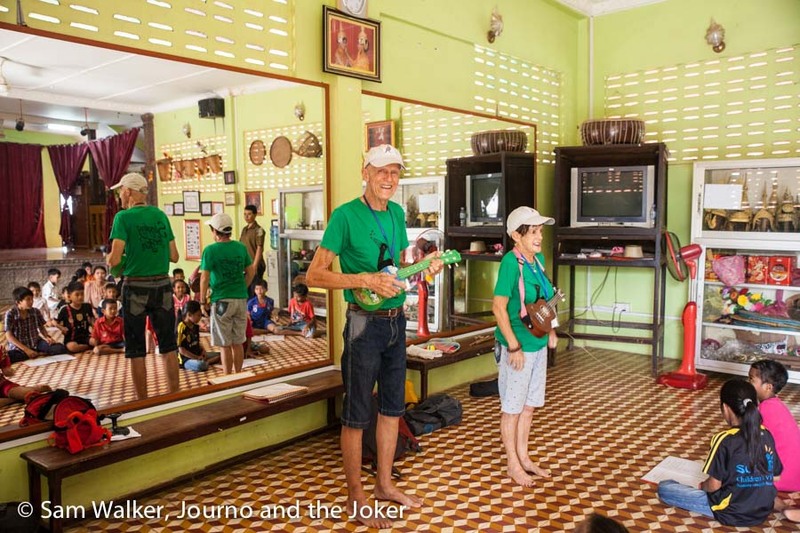 The couple moved to Siem Reap in Cambodia to share the love and to sing up a storm for Cambodian school children. “Schools were our focus — underprivileged, of which there were plenty,” Maggie says. And gee, did they have some fun. The grin on Rollo’s face spread nearly from ear to ear as he started playing the banana song to a group of about 30 or so children. It’s a favourite. They get to act out the words and there’s some funny and some gross actions that certainly appeal to childish humour — big kids as well. “It’s a roaring success; this we always leave to last,” Maggie says. It’s an eclectic mix of songs they take with them to the schools. Jingle Bells, Twinkle Twinkle Little Star and Happy Birthday are all favourites. Weirdly, Happy Birthday is popular with many people in Cambodia regardless of whether or not it is anyone’s birthday. The Magpies piled onto their trusty scooter about six or eight times a week, loaded up with a number of ukuleles, song books, percussion instruments and a range of props. Sometimes there were 30 odd jam sandwiches or three dozen boiled eggs as part of a breakfast program. And off they went to various schools to spread a love of music, get some creative juices flowing and add a little colour to the lives of children who hadn’t seen anything quite like this enigmatic and energetic pair. “We had to be flexible, go with whatever was happening in the school. Numbers would swing from five to 50. No two lessons were alike,” Maggie explains. The small kids couldn’t speak any English so they relied on action songs with lots of clapping and stamping. 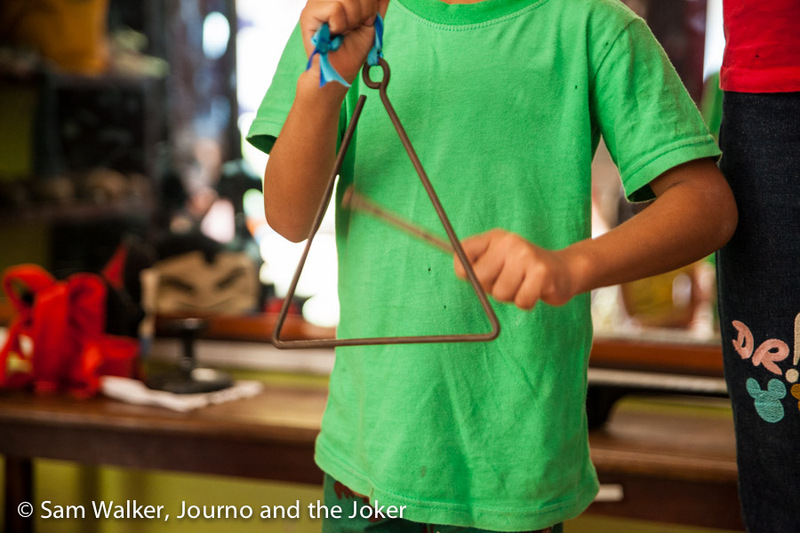 And they used bells, cymbals, soft squeaky toys and shakers. 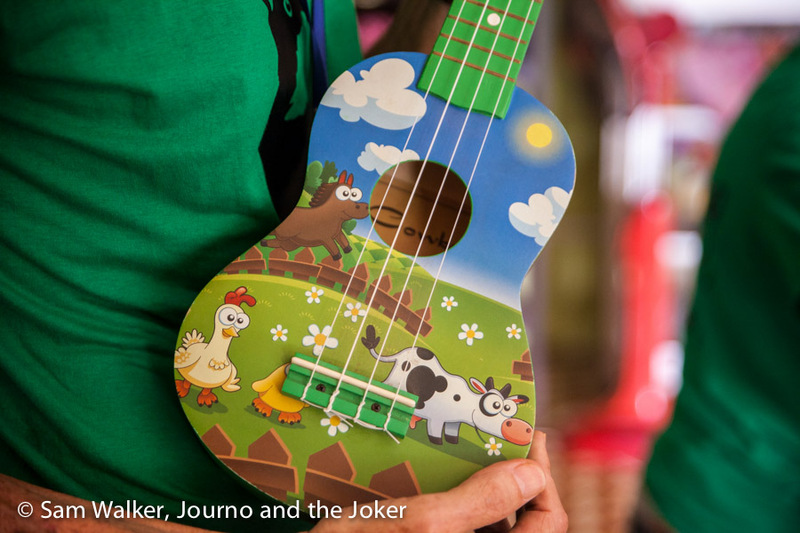 The children were often invited up to play an instrument — some even got to try the ukulele. Most Khmer schools don’t have a music curriculum so the majority of students are not introduced to music like this at such a young age. Rollo laughs as he tells of some children who participated who just didn’t have any rhythm or singing aptitude, but they were keen to get up and have a go. Others took to it like ducks to water. Rollo was in his element, strumming the ukulele, jumping around through the class like a kangaroo and setting a rhythm. He didn’t stop grinning for the entire hour he was up on stage. 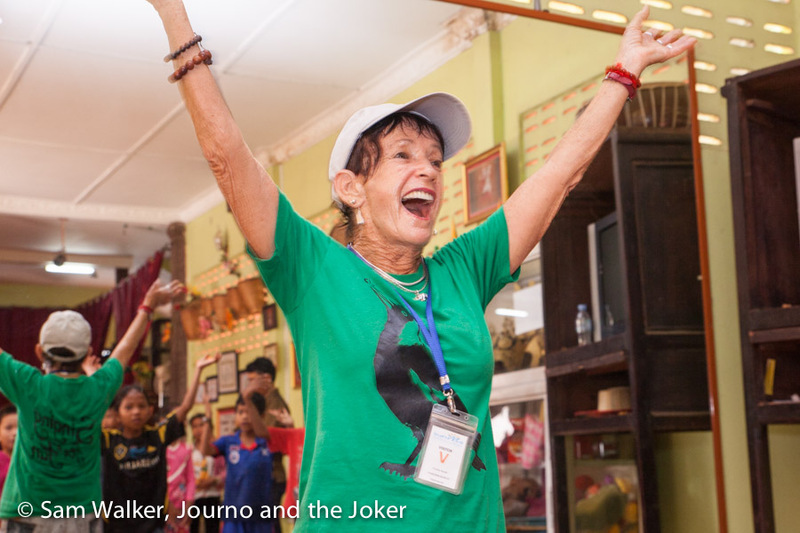 It’s hard to say who had more fun at these sessions — the Maggies or the children. “It beats the heck out of accounting.” Rollo says, his big grin slowly spreading across his face and his eyes lighting up with delight. Yes, it is hard to imagine him in a suit and tie facing a ledger of numbers after seeing him jump around like a kangaroo, his beanstalk figure towering over the tiny Khmer students. The pair of them were buzzing after a class, keen to analyse what worked and what didn’t; laugh at the little quirks that happened and make changes for the next class. It’s the way they prefer it. Carefree and independent, sharing love and music, songs and goodwill wherever they go. “It has been an exciting, satisfying fun year, we have learned from the children and love our work,” she says. The couple are well-known around Siem Reap and have made many friends among the Khmer people and the expat community. Their energy is uplifting, their enthusiasm contagious. And there’s no sign of slowing down for these septuagenarians. They’re back in Australia, recharging the batteries for a few months. But the adventures haven’t stopped. They’ve been house-sitting for friends on the Sunshine Coast and will soon embark on a road trip up through central Australia and on to Darwin. And they’ll be back in Siem Reap in the middle of year, after the worst of the dry season has passed and the weather is starting to cool to something slightly less than a permanent sauna. 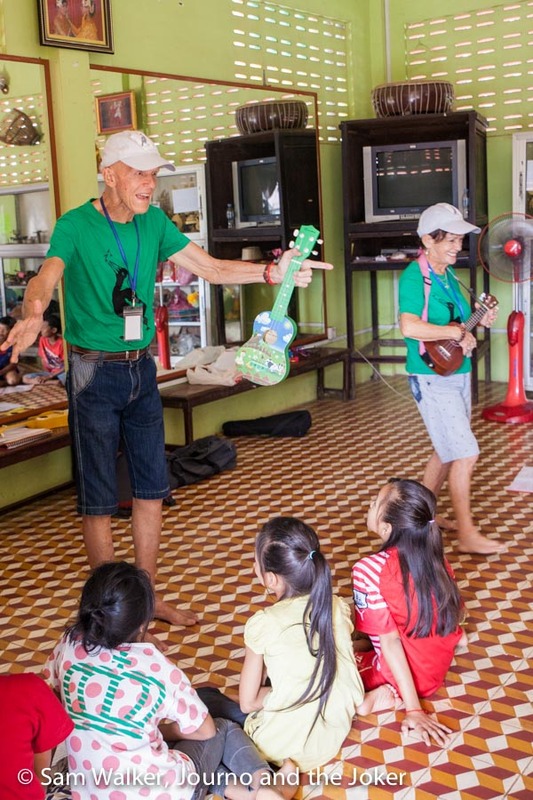 And school children in tiny poor schools throughout the Siem Reap district will be clapping and tapping and singing along to Happy Birthday once again. You can read more about Maggie’s adventurous spirit here. I wish I had heard about these good people earlier! Thanks Sam. Amazing in such a small community like Siem Reap.that there are so many people you know and yet still some that you don’t know. I think you would have enjoyed Maggie and Rollo. Characters for sure. And so full of energy. What a lovely couple. Just goes to show, you can have an adventure at any age. Wish them all the best for their next pursuits. Thanks Nina. Yes, they are lovely. Should be more people like that in the world. And they are definitely an inspiration to all the people who have excuses for why they cannot follow their dreams and do what they love. Awesome job capturing this exceptional couple with gorgeous photographs and descriptive story-telling! Thanks Tamara! Glad you enjoyed their story.